Sew what's cooking with Joan! 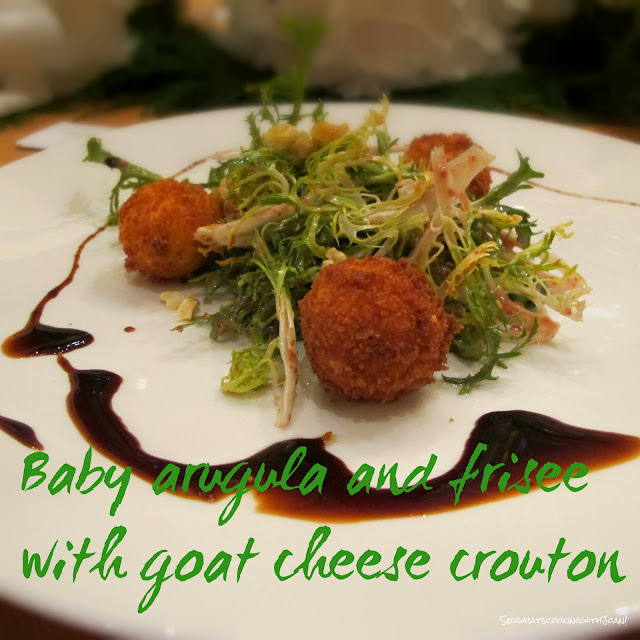 : Baby Arugula, Frisee Salad with goat cheese crouton! 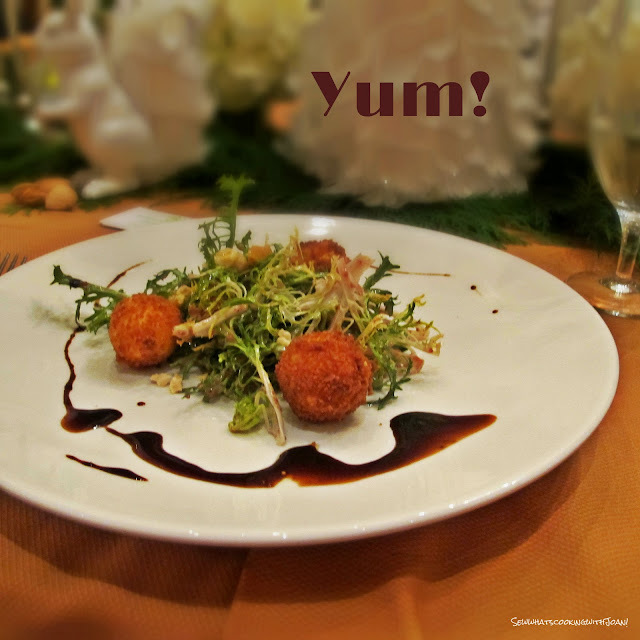 Baby Arugula, Frisee Salad with goat cheese crouton! I love salad every possible version of salad, so much that Wee Bear frequently calls me a rabbit! I love to create my own salads or twist a version that I have eaten at a restaurant or learned from one of my many classes. In this case, I am giving you a tutorial straight from a class. This one from Chef de cuisine Joe Worrell at Chochise-Geronimo, Desert Mountain. Chef Worrell began his culinary career in 1992 at Ugashi Japanese of Portland, Oregon. 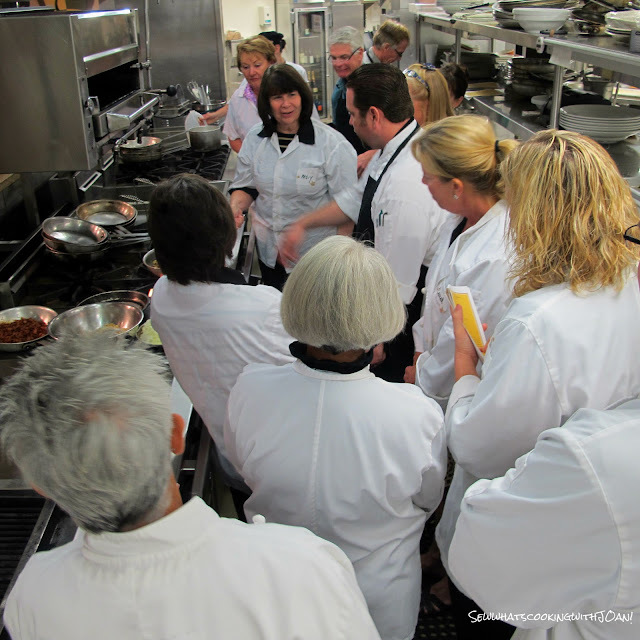 Joe joined Desert Mountain in 2005 as the Sous Chef at Cochise/Geronimo Clubhouse and then in August 2007 took the helm as Chef De Cuisine of Apache Clubhouse. Joseph has now returned to Cochise/Geronimo as of February 2013 as the acting Chef de Cuisine taking over responsibility for all clubhouse catering as well as the club sponsored events.... he is amazing! Bring goat cheese to room temperature. Mince garlic, onion, bacon. Snip chives, slice dates and roughly cut walnuts. In a saute pan render bacon, then add onion, sweat for a few minutes, add garlic and dates and saute briefly. Season with salt and pepper and remove from heat. Add the walnuts, put in a shallow baking sheet and chill. Once this mixture is cool, add chives. Form about 1 ounce of goat cheese into a ball, with your thumb, make a depression into the ball so that you can put some of the filling inside. Once you have put the filling into the balls and sealed up....chill for 20 minutes. Start the breading process by lightly flouring the goat cheese balls and placing them in the eggs wash, coating the ball and finally into the Panko bread crumbs. Fry in deep fryer or deep pot. Reserve. Clean arugula and frisee, put into bowl. Vinaigrette: In a food processor or blender combine the grained mustard, sherry vinegar, process for a few seconds, then with the blender/processor running slowly add the oils, season with salt and pepper. Assemble: toss the vinaigrette with the greens and put on a plates. 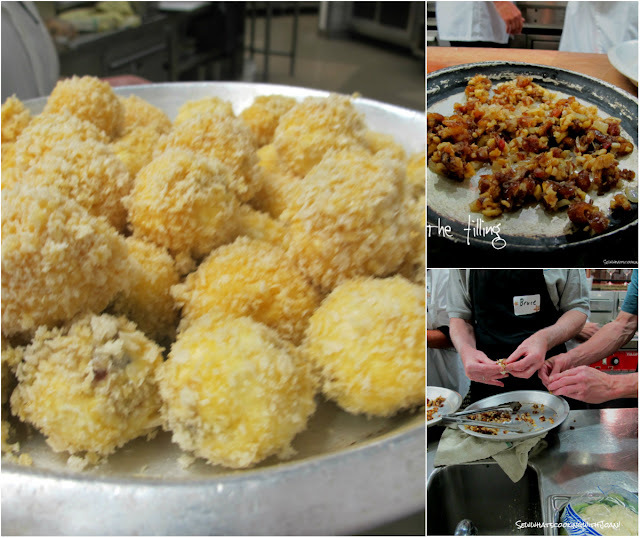 Add 3 each of the fried goat cheese balls, and garnish with candied pecans. To make the candied pecans, pour the sugar in a small skillet and pour the pecans on top. Cook over medium heat until sugar melts and turns a caramel color stirring constantly so that the nuts and sugar do not burn. Be patient! It takes a while for the sugar to start melting. Once the sugar turns a caramel color coat keep stirring to coat the pecans with it. Pour pecans onto greased wax paper or aluminum foil to cool. Once pecans are cooled, break them into pieces. I am off to Cabo San Lucas today for a golf tournament, "The Blue Agave Classico" at our old club, Querencia. Wee Bear and I are staying at a dear friends new home and I can't wait to see it!! They started building just before we moved from Cabo San Lucas and now, we not only get to see this Hacienda style home, we are staying there!! We had flown to Guadalajara with them in the research stage of building this beautiful home. Good friends from Mercer Island, Washington, are flying in as well and when the six of us get together..........well, it's a party!! The itinerary is full with parties and dinners every night and golf almost everyday. Susan and I will be in competition on Saturday and Sunday, lots of fun! No worries, I have all my posts written and Sweet One may pop in as well with her temptations! 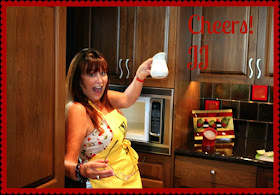 We are approaching "Sew What's Cooking With Joan" 1 year anniversary on March 7............can you believe it? I committed for a year, it has been fun and now, we are in discussion stages of where we are going...........stay tuned! P.S. 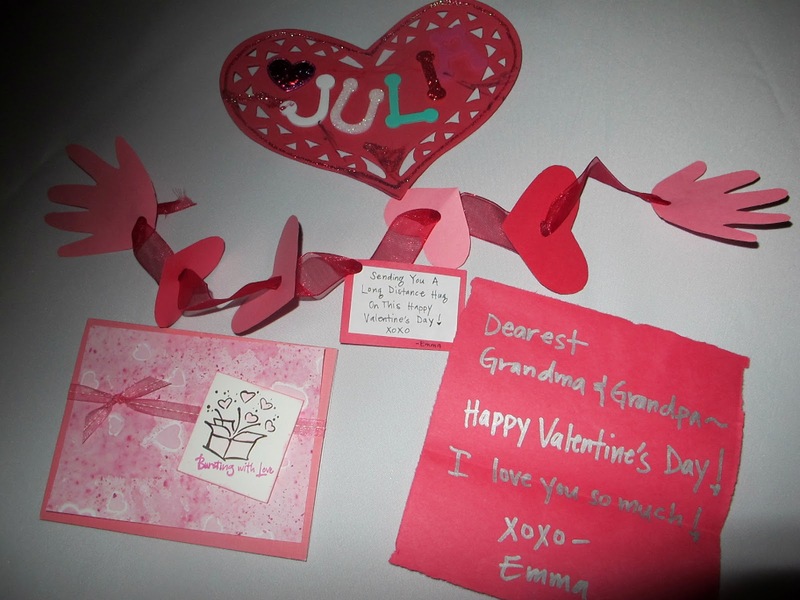 After being away in Ochi for 3 weeks, check out what we came home to from our gifted Grandchildren! Lasagna two ways! Figure friendly! Stuffed Cheesy Shell's! From Laura! Chicken in Wine sauce! Wee Bear style!